Franks blog on running and other existential matters of life. On Sunday 11 September I didn't think too much about the Twin Towers or the Pentagon.My first concern was how to get to the starting line of the Jungfrau Marathon, in Interlaken. 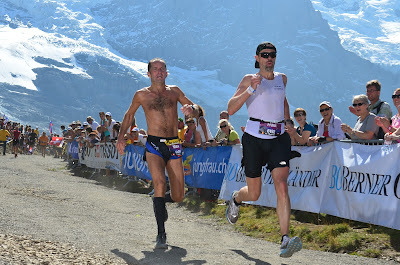 When I booked a bed in the Grindelwaldblick mountain hut, close the finish of the marathon, I didn't know that the first train down from Kleine Scheidegg was only at 8am with arrival at 9.24 in Interlaken, 24’ after the start gun would go off. So I got up early to descend by running but luckily the local postman on a quad motorbike spotted me and gave me a ride to Wengen, where a Swedish couple gave me a comfortable ride to the starting line. So I had plenty of energy when the race started and managed to run the first half in a decent 1:40, including a few hundred meters of ascent. But then steeper hills and slopes forced me to a run/walk strategy to avoid blowing up the engine too soon, also taking into account the sun and mounting heat - it was a real summer day while the previous week there was rain and snow. With increasing effort the landscape became more rewarding so the time was flying. Distance markers were placed at every 250m which - to my surprise - helped even more in moving fast forward. Nevertheless, the very steep glacier moraines towards the end slowed me - as most of the runners around me - down to a brisk walking pace, so time was piling up. When I reached the summit, I could see the finish line and switch on my turbo for a fast last k, taking back many runners with more vertical speed. 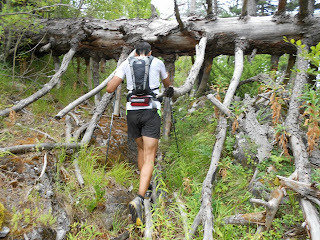 In sight of the line, I closed the gap with a local runner called Max, but Max didn't let go and picked up the pace. We ended sprinting full-out and we needed some strong guys to hold us from crashing beyond the finish line. I won the sprint for the 413th position (on nearly 4000 participants), in a time of 4:22:57. Not a great time compared to the winning time of 2:59 (how on earth did he do that), but OK he was crowned World Champion Mountain Running 2012 and I did it as a last advanced training for the Spartathlon. After a refreshing shower, a couple of beers and even a hot dog with sauerkraut, I added a recovery walk/run of 10km down to Grindelwald (but back up with the last train). Next day I woke up without soreness and took the first train to the Jungfraujoch, the highest public train station of Europe, at 3.454m or 11.333ft, topped up by the Sphinx Observatory to 3.571m. This visionary rail-project was already ‘sketched’ in 1893 and opened on 1 August 1912, just over 100 years ago! 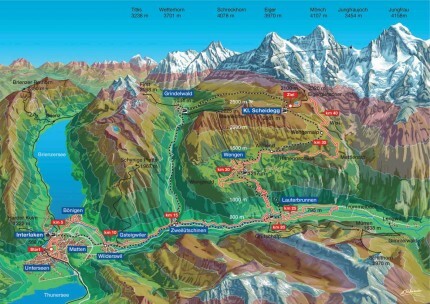 The train goes straight into the Eiger, the iconic mountain with its brutally steep north-face, the locus of many mountaineering victories and drama’s. I like running mountains and I even don't mind falling but I’m not tempted to climb with hooks and ropes, with a fatal fall only one small mistake away. Once up at Jungfraujoch, an arctic underground theme-park ‘Alpine Sensation’ is neatly laid-out for the thousands of visitors, daily. Luckily there is an exit to enjoy the natural beauty of the glacier and the impressive snow and ice capped peaks of the Eiger, Mönch and of course the Jungfrau, with its 4.158m the highest of the three. There was no point in going up there, but there was a nice glacier ‘path’ to the impressive Mönchsjochhutte at 3.650m altitude and I decided to run it. I was positively surprised that running a 5k at this altitude is well possible, but only with a high fitness level, as my fellow-countryman, who also finished the marathon the previous day, experienced to the extent he was forced to return to lower altitude. On the way back with the train I stepped of the train at the station Eigergletscher and ran down for another few k’s and 300 vertical meters, with a very rewarding pause at a glacial lake with bubbling ice-water; the perfect ice-bath for feet and lower limbs. 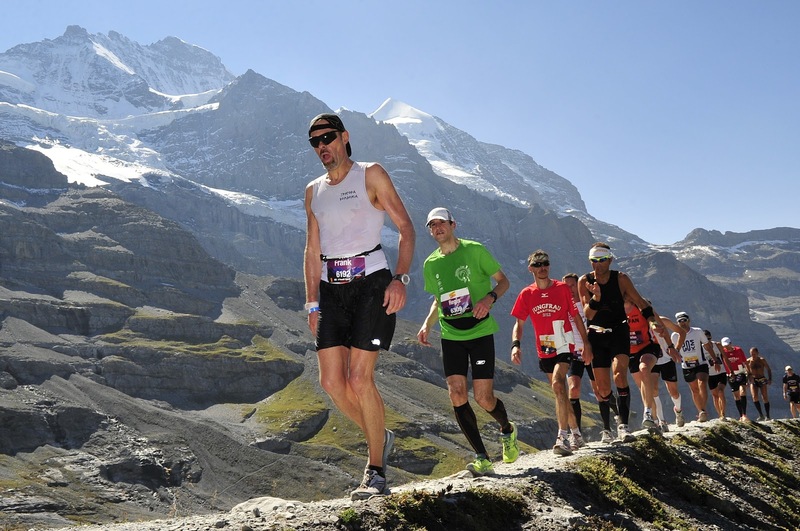 All in all, the Jungfrau marathon was a great experience, thanks to the fantastic weather conditions, the perfect organization and of course the natural setting of green meadows, forests, mountain villages and impressive peaks and glaciers. The Jungfrau marathon was a far better experience than the 100km Olympus Mythical Trail on 7 July, a grueling mountain-trail-race to and around the summit of Greece’s highest mountain (2917m), with 7000m elevation gain in total. Compared to that race, JM is an easy piece of cake! OMT was actually the first race ever I DNF-ed, a feared term among runners meaning Did Not Finish. I’ve quit the race after 62km and 12 hours or so, on raw soles and battered legs. Around 200 experienced mountain runners started this inaugural race at 1am, in rather hot and very humid conditions (I was already sweating before having started). I ran well the first 30-40km and moved up to the leading pack of 20-25 runners. But slightly oversized shoes and single layer socks were the wrong answer to the agonizing conditions of the mountain track, if any. Around 50k my legs and stomach were screaming too, probably due to sweating out too many salts and reaching an alarming state of dehydration, with temperatures weigh above 30C. When I started to hallucinate and see non existing aid stations, I sensed it was pointless to run another 40k and 2000 more vertical meters, which took most other runners between 10 to 14 hours more to cross the finish line (in the middle of the night). 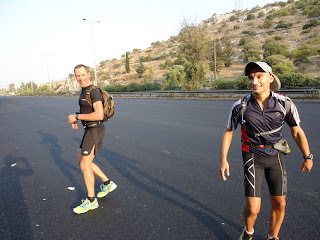 Yet, when I noticed that many runners took a recovery-break of one to several hours at the 66km check-point; as well considering that I also recovered well after a while, I probably could finish too, but with the risk of losing the joy of running altogether. On the other hand I was not unhappy to have found my limit and instinctively I know that I will have to push that limit if I want to finish the Spartathlon race end of September. 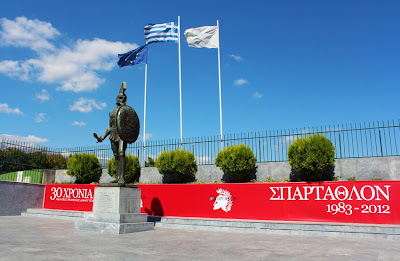 I also learned that running in heat is stressing my body and brain more than I can absorb, so I would have to train more in the heat to make a chance to get through the first leg of the Spartathlon, often facing soaring temperatures. On contrary, when I started the marathon of Torhout on 22 June, better known as the ‘fabulous’ Night of Flanders, and having no intention to run fast so close to the OMT, the cool weather allowed my feet to move at a fairly fast pace, with a 1:28 at the halfway mark, and than slowed down by a strong headwind but still finishing the ‘training’ race in a decent 3:06:33, my average marathon time this year - so far. Apart from the time I was happy to have ran with some of Belgium's finest ultra-runners. ‘Luckily’, there was no shortage of chances to run in more hot conditions after the defying OMT. Finishing my multiple year mission in Kosovo, I returned home on 15 July and when I arrived in Athens the thermometer was peaking 41 degrees Celcius, followed by more bloody hot days and nights. Due to over-exposure to airco’s I fell ill for the first time in very long; probably also a reaction to some hard working weeks and the packing and moving out. Soon came the time to travel to Mesta, on the mastic island of Chios, where we enjoy our yearly summer holidays and where we would baptize our daughter on the 29th of July. In Chios I resumed running, often combined with swimming in pristine bays. 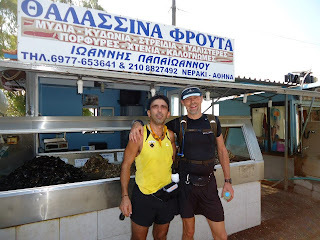 On most of these swim/runs I was happy to have my Belgian running friend Lowie as sparring partner, especially for the ‘great Chios run’ criss-crossing half of the island and covering a distance of 77,5 km and 3.200 vertical meters, under a burning sun and 35 degrees. Again I faced problems with the heat, but this time I poured much more water and isotonic liquids into my system. Two weeks later I would attempt another ‘great Chios run’ of about the same distance, but suffered much more due to hot and heavy winds, as well the smoke of fast-spreading wildfire that would destroy or damage a bigger part of the southern half of the island - known as the Chios tragedy (with 15.000 hectares of lost forest and cultivation land with world unique mastic trees, causing a massive environmental, cultural and economical disaster to the island and its population). 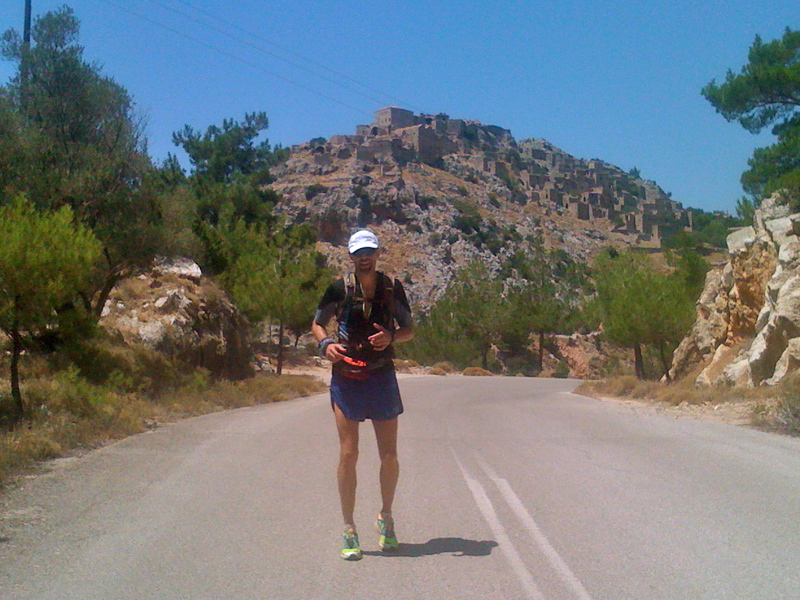 In between I had the ‘smart’ idea to run the first leg of the Spartathlon, from the Acropolis in Athens to the famous canal of Corinth, 81 km. Two local running friends joined and the first 30-40k went pretty easy. But slowly my brain turned sun-boiled and my legs sun-fried; with a break-down around the 50k-mark. The vista of a turquoise blue sea with a sea-turtle and bathing folks broke my mental resistance completely and I surrendered to a refreshing swim and a walk to the next railway-station at the 57 k mark, while the real tough guys continued and completed the distance. Again a lesson in humility! I’ve had to fear for the worse if my Sparta-race would end the same as my Spartan training! On the other hand, one can learn more from mistakes than from successes only. Benefiting from mistakes and failures I also what learned from reading stories and books such as ‘Why we run’ from Robin Harvie and ‘Eat & Run’ from ultramarathon greatness Scott Jurek. 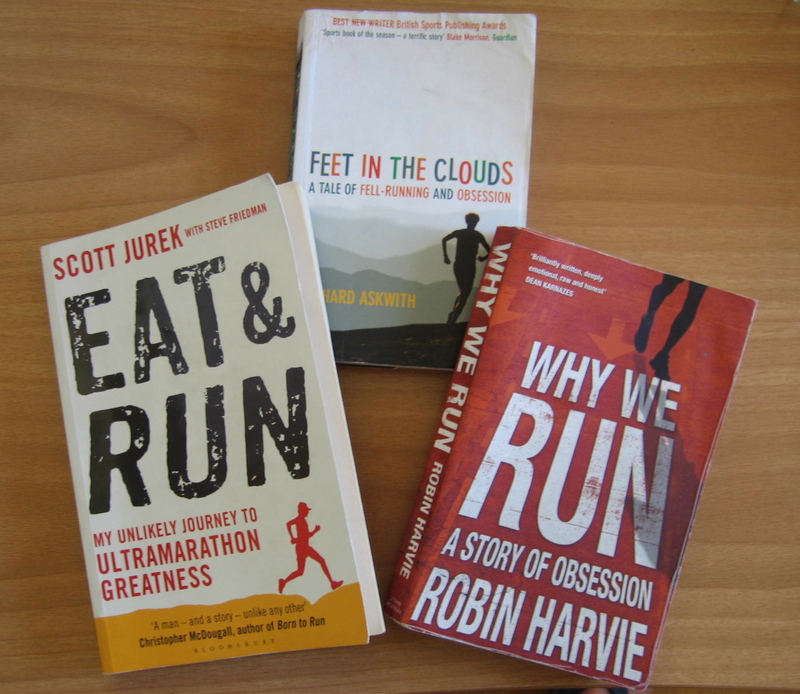 Interestingly, both authors ran the Spartathlon. 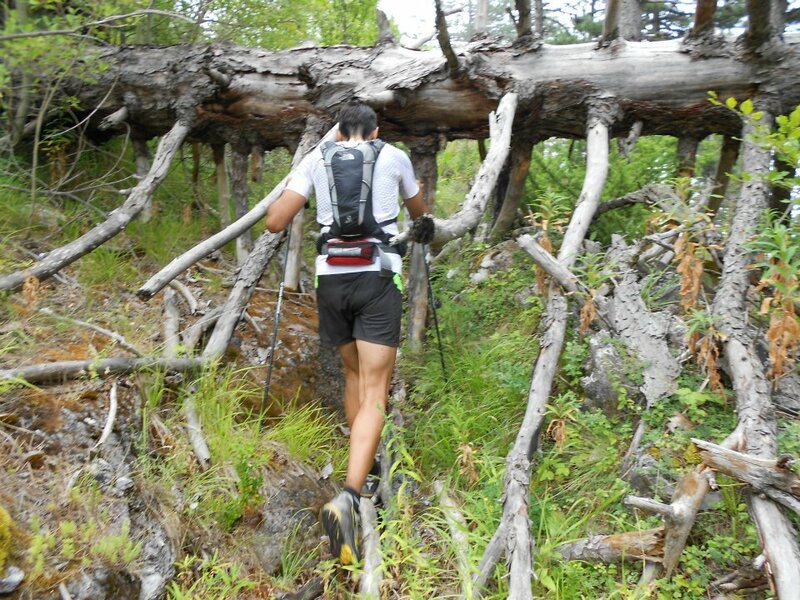 Harvie had to DNF after 17 hours and 136 km, while Jurek participated three times and WON three times (2006-2008). Whilst the professional runner Jurek is probably more gifted or talented than the recreational (but obsessive) runner Harvie, Jureks key to finish and win ultra-races is his mental strength rather than his physical strength (only). A strength to push the limits where other runners see no space anymore. To accept lows (and very lows) and gradually climb out of them without panicking. To break down and stand up again. To continue where ‘normal’ people say ‘enough is enough’. Therefore it’s no coincidence that Jurek’s delicious book - full of recipes for healthy running and eating - opens with a quote from William James, a pioneering American psychologist and philosopher who was trained as a physician. If this ‘borrowed wisdom’ will be enough to get me through the lows and run beyond exhaustion is to be seen and experienced. I will give it my best shot on 28/29 September and I feel lucky that I am allowed to start in the 30th edition of one of world’s toughest ultra-races, or to say it with Jurek’s words: to reach for something outside my comfort zone! King Leonidas, here I come! I'm a usual guy with an unstoppable desire to do unusual things in life.